Hi, Frank Indiviglio here. 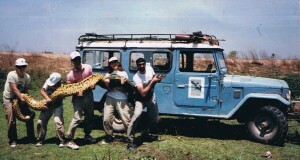 I’m a herpetologist, zoologist, and book author, recently retired from a career of over 20 years with the Bronx Zoo. The magnificent Eastern Indigo Snake, Drymarchon couperi, is the longest of all snakes native to the USA, but occupies one of the smallest ranges. These facts, along with stunning coloration and its reputation as a responsive pet, place the Indigo on the wish lists of serious snake keepers and zoos worldwide. I had the good fortune to assist with an Eastern Indigo breeding/release program headquartered at the Bronx Zoo, which was both fascinating and frustrating. Today I would like to pass along some thoughts on its natural history and captive care. The Eastern Indigo Snake is among the longest of all North American snakes; in the USA, only the Bullsnake, Pituophis catenifer sayi, regularly rivals it in size. Robust and alert, the Eastern Indigo Snake averages 5-6 feet in length, with a record of 8 feet, 5 inches. The glossy, blue-black coloration is unique to this species. Some individuals, greatly favored in the pet trade, sport heads and chins highlighted by a reddish tint. The Eastern Indigo Snake is restricted to southeastern Georgia, southeastern Mississippi, and Florida. Although coastal dunes, Palmetto scrub, agricultural areas and marsh fringes are colonized, healthy populations seem to require large expanses of longleaf pine forest and similar upland environments. Human development within prime Indigo habitat has severely threatened this species’ future. Today, only captive-born individuals may be legally sold, but over-collection was a severe problem in the past. The Texas Indigo Snake (D. corais erebennus) ranges from southern Texas to central Mexico, while other relatives, known as Cribos, inhabit Central and South America. Eastern Indigos actively search for their prey, which includes a surprisingly-wide array of creatures. Rodents, rabbits, birds and their eggs, lizards, frogs and even small turtles are taken. Snakes, including rattlesnakes and other venomous species, feature heavily in the diets of some populations. I have first-hand experience with impressive biting power packed by most rodents, and find it amazing that Indigo Snakes do not utilize constriction, but merely grab and swallow their victims! The Indigo Snakes I worked with were only moved about during cage cleaning, and this was done as quickly and efficiently as possible. Consequently, most made a great show of flattening their heads, hissing and vibrating the tail when approached. This is typical of all Indigoes that are not handled regularly. However, with care and attention, most calm down in time. In fact, many consider them to be the gentlest of the larger Colubrids. In years past, Indigo Snakes were commonly used by dancers and snake charmers in travelling circuses – the writings of Raymond Ditmars and others of his time feature interesting stories on this aspect of their captive history. Alert and quite aware of their surroundings, Indigos seem much more responsive to people than is typical of snakes in general. However, they tend to move about when held, and can be difficult to control. Bites may occur even where well-habituated pets are concerned, as hungry individuals will strike at nearby movements. Indigo Snake ownership should not be entered into lightly (considering the prices they command, it usually isn’t, but still…!). They are very active, and do poorly in cramped quarters. A typical adult requires a custom-built cage measuring at least 6 x 4 feet. A dry shelter, and another stocked with moist sphagnum moss, should be available. Cypress mulch, aspen bedding and similar materials may be used as substrates. Due to this snake’s vigorous movements, newspaper tends to wind up crumpled in a corner. Washable terrarium liners be used for younger animals kept in aquariums. Indigo Snakes favor cooler temperatures than might be expected, and fare best in a temperature range of 70-78 F. An incandescent bulb should be used to create a basking spot of 85 F.
Large enclosures are necessary if a thermal gradient (areas of different temperatures) is to be established. Thermal gradients, critical to good health, allow snakes to regulate their body temperature by moving from hot to cooler areas. A ceramic heater, heat pad, or red/black reptile night bulb can be used to provide heat after dark. As mentioned above, Indigo Snakes will eat nearly any animal that they can overpower. Captives, however, do fine on a straight mouse and rat diet. Indigos should be offered smaller rodents than might be accepted by similarly-sized snakes of other species, as their jaws do not stretch to the same extent. They have fast metabolisms, and may need to be fed a bit more frequently than each 7-10 days. Indigo Snakes produce copious, watery waste products at frequent intervals…near daily cleaning is often necessary. Keepers weaned on Ball Pythons and similar snakes will be in for quite a surprise! Water for drinking and soaking should be available. Bowls are best filled to a point where they will not overflow when the snake curls up within, as damp conditions will lead to fungal infections of the skin and other health problems. A winter cooling period of 60 F, with a basking spot of 78 F, will stimulate breeding. However, consistent results are elusive, and poor egg fertility is a problem in both private and public collections. Pairs must be monitored carefully, as males may bite females during courtship. A typical clutch contains 6-12 eggs, which may be incubated in vermiculite at 75 F for 110-120 days. I will be doing some training in the Texas area during the May – June time frame and would love to see some Texas Indigos! Can you offer some areas/times (during those months) where I might get some sightings? Where can I buy blue indigo snakes? I would love to have a few on my property to control the rattlesnake population. Thanks! 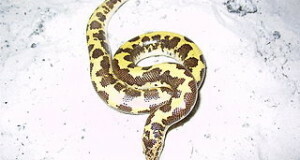 They are bred by only a few specialist private breeders (advertised on kingsnake.com) but they cannot legally be released (disease transmission to endangered population, native to only a small natural range, etc); in any event, they average $800-1,000 each, and would not effectively control rattlesnakes or remain where released. Being born with a deep interest in animals might seem unfortunate for a native Bronxite , but my family encouraged my interest and the menagerie that sprung from it. Jobs with pet stores and importers had me caring for a fantastic assortment of reptiles and amphibians. After a detour as a lawyer, I was hired as a Bronx Zoo animal keeper and was soon caring for gharials, goliath frogs, king cobras and everything in-between. Research has taken me in pursuit of anacondas, Orinoco crocodiles and other animals in locales ranging from Venezuela’s llanos to Tortuguero’s beaches. Now, after 20+ years with the Bronx Zoo, I am a consultant for several zoos and museums. I have spent time in Japan, and often exchange ideas with zoologists there. I have written books on salamanders, geckos and other “herps”, discussed reptile-keeping on television and presented papers at conferences. A Master’s Degree in biology has led to teaching opportunities. My work puts me in contact with thousands of hobbyists keeping an array of pets. Without fail, I have learned much from them and hope, dear readers, that you will be generous in sharing your thoughts on this blog and web site. For a complete biography of my experience click here. The Season Has Changed, Should Your Reptile Bulbs? Why Do My Crickets Keep Dying? That Reptile Blog is designed to help promote knowledge of the pet hobby. If you wish to reference or cite specific information from a blog post, we ask that you provide a link back to the original. The content on That Reptile Blog is copyright protected and may not be duplicated without written permission. If you have any questions on this policy, feel free to send us an email at blogs@thatpetplace.com.